This large and colorful bowl is from the End Of Day series, meaning it is made with a variety of colors used throughout the day. This is a BIG bowl, measuring over a foot wide. 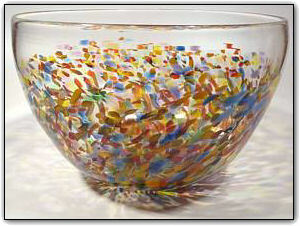 The colors are very deep and intense, contain nearly every color in the rainbow atop a canvas of elegant clear glass. Make sure to zoom in to see how bright and vivid the colors are!